Once I was done with all this outlining, which took more time than I care to remember, I assumed that I would follow my usual pattern for legal briefs when I have a comprehensive outline: I work my way down the outline turning it from a sort of free-form verse into narrative prose. It’s an efficient process, that takes much less time than the outlining itself. Except that’s not what has been happening with my novel. The problem is my characters. As I write them, they take on a life of their own and refuse to conform to my narrative will. I put them in a scene and tell them to do “X,” but they absolutely refuse. Instead, they insist on doing “Y” or, much to my dismay, even “Z.” Their stubborn intransigence has reduced my outline to a meaningless laundry list of abandoned ideas. It’s bad enough that my characters refuse to conform to my imaginings. What’s worse is that their re-creating themselves, often in ways surprisingly better than I imagined, creates a ridiculous amount of work for me. In this, I liken them to knitting errors. In knitting, as in writing, things sometimes go awry. Few of us, faced with a pattern that’s deviated from the chart have Grace Coolidge’s courage. Legend has it that someone was visiting with Calvin Coolidge’s wife when the latter discovered a mistake in her knitting. The sympathetic visitor said, “Oh, you poor dear. Now you’ll have to tear out all those rows.” “Not at all,” answered Grace. “I just see it as a new pattern and continue from there” (or words to that effect). Most of us are like Grace’s visitor — we tear it out, sometimes called ribbiting, because you “rib it” (and yes, even knitters have bad puns). An alternative, if only a few stitches or rows are involved, is to unknit; that is, you literally do the mirror image of each stitch, uncreating as you once created. This is called “tinking,” which is, of course, “knit” spelled backwards with an added -ing suffix. My recalcitrant characters are introducing me to the novelist’s equivalent of ribbiting or tinking. When my characters take on their own lives, I find myself going back chapter after chapter, rewriting those characters. Worse, because their stubborn insistence on unique personality traits inevitably conflicts with my other, more mannerly, docile characters, I end up having to re-write those characters too. 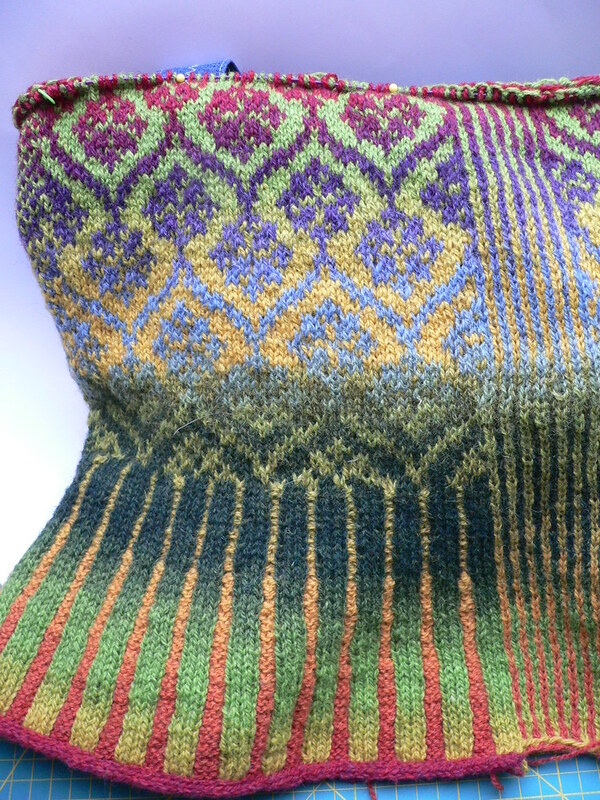 Obviously, it’s frustrating and time-consuming, but I have to admit that, just as my intended pattern was somewhat drab and repetitious, I find myself looking at something much more interesting and beautiful (and the above photo is a stunning example of Fair Isle knitting). Nobody said writing a novel would be easy, but I never thought I’d find myself in a battle of wills between the creative side of my brain and the orderly one. I just hope the novel turns out as well as the knitting usually does. A one-time history major who has spent decades preparing to write the story of her family's journey through 20th century European and Middle Eastern history. Characters do say the darndest things, which is a sure sign that your on the writer’s path. The comparison to knitting is wonderful, much better than a writer friend of mine who compares writing a novel to digging a ditch.